One of the major challenges affecting rural communities in Sierra Leone is access to quality information. What often goes wrong in these communities is attributed to the lack of accurate, correct, and timely legal information. 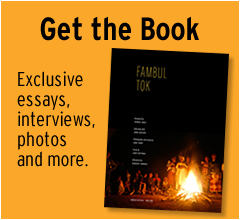 Over the years, Fambul Tok has observed that there is no locations in rural communities where people can access accurate and timely information whenever the need arise. Most people, to a great extent, depend on” hear-say”, or what is referred to in Sierra Leone as bush radio. When laws are enacted by the government of Sierra Leone, a major hurdle is figuring out how to ensure that rural villagers and illiterate people understand what the law entails. Many protocols and procedures are required by the government, but many people do not understand understand them or know their importance. 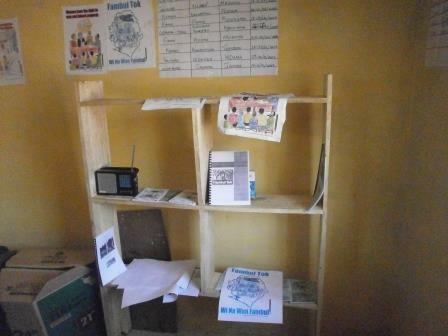 Because of this detrimental lack of access to legal information, Fambul Tok International-Sierra Leone, has deemed it fit to open information kiosks in various sections and chiefdoms in Fambul Tok operational areas. 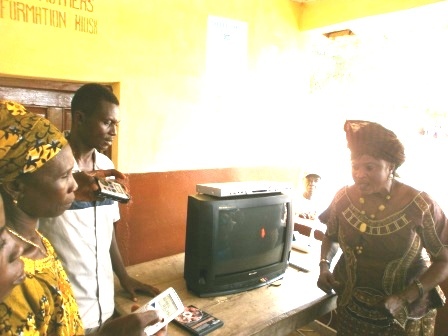 The first set of information kiosks were developed in Nimiyama and Gbense Chiefdoms in Kono District, Eastern Sierra Leone. Executive Director of Fambul Tok International-Sierra Leone, John Caulker, underscored the importance of the information kiosks in his brief statement during the Peace Mothers dialogue prior to the official inauguration ceremony on May 13, 2014 at Condama town in Nimiyama chiefdom. 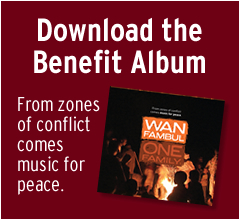 John Caulker said Fambul Tok continues to create space for Peace Mothers to interact, to identify major challenges, and to involve stakeholders in the development processes. John Caulker stated that the information kiosks would go a long way to ensure Peace Mothers and other community members have access to quality information materials. He said the kiosks will be furnished with TVs, radio sets, DVDs, generators, and reading materials, especially regarding the gender laws and the Child’s Rights Act. Furthermore, educational posters concerning the Gender Acts and other important laws will be available for the use of the entire section and chiefdom. He discloses that the maintenance cost for the kiosks was provided to the two chiefdoms, adding that other district are expected to benefit. 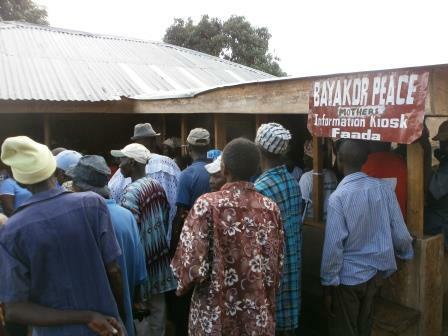 The Executive Director encouraged people to use the kiosks to gather information regarding registration of customary marriages, births, and other materials available to fast track these processes. Additionally he cautioned for the judicious utilization of the items, stressing that they should be used as their own property. On behalf of the three chair-ladies of the various sections in the chiefdom, Kumba Yarjah extended thanks and appreciation to Fambul Tok, the US Government, and other philanthropists that continue to support women, especially the Peace Mothers of Sierra Leone. Officially opening the kiosks in Condama town and Faada town, Deputy Mayor of Koidu New Sembehun City Council, Madam Theresa Sia Gbenda highlights major challenges women continue to face, focusing on access to information. She says most women do not know the existence of gender laws, explaining that Fambul Tok is the only organization that is addressing this issue through the Peace Mothers program. She confirms the Council’s support of women, adding that it reduced the cost for registration of customary marriage to a minimum fee of 50,000 Leones. She also called on Peace Mothers to make use of the kiosks and asked Fambul Tok to facilitate the process of registering marriages and birth in communities with the provision of vehicles or human resources when the need arises. 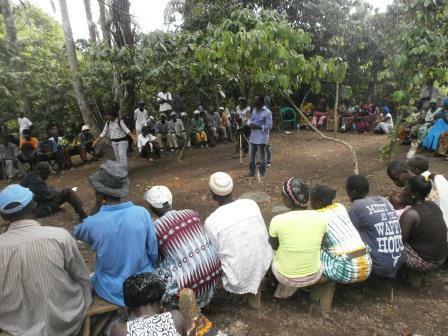 This entry was posted in From the Ground: Program Updates from Sierra Leone, Kono District, Organization, Peace Mothers and tagged peace mothers in Kono. Bookmark the permalink.